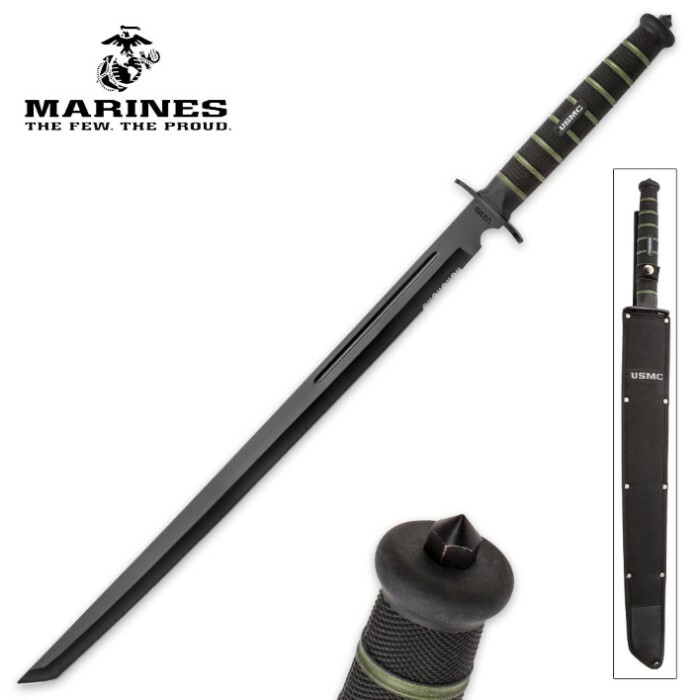 Expertly fusing tradition and innovation, the officially licensed USMC "Blackout" Combat Sword is an undeniably modern take on an iconic, time-tested USMC sword design. Its potent 19 3/4" AUS-6 stainless steel tanto blade features the classic nonreflective black coating, enlarged blood groove, partial serrations and prominent "USMC" stamp that old-school Marine combat sword fans know and love. It's a tried-and-true blade design that continues to prove its worth on the battlefields and in the back country wildlands of the present day. Beyond the blade, the Blackout Sword's handle is encircled by five green bands - an aesthetic nod to the classic combat sword's emblematic stacked leather handle. But the familiarity largely ends here - with respect to the handle, at least. 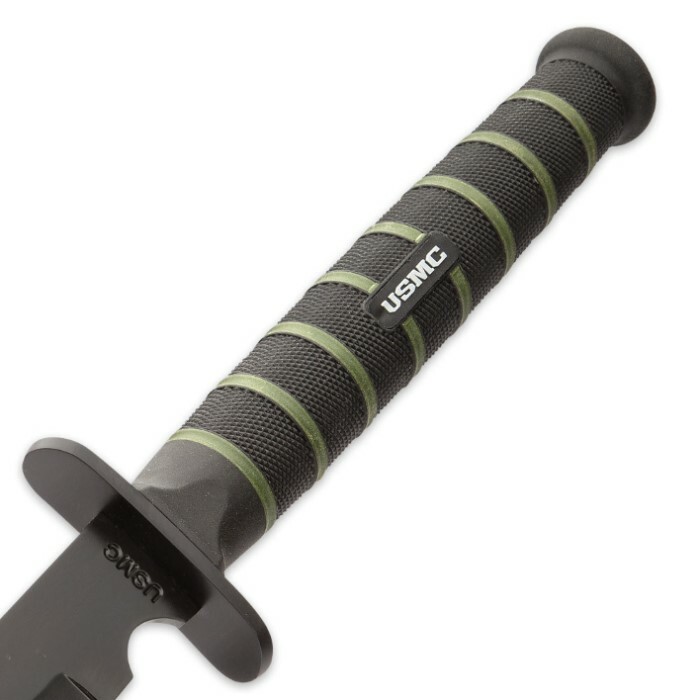 Retooled to satisfy the unique tactical demands and survival challenges of the modern era, the Blackout Sword's advanced injection molded handle is extraordinarily durable and boasts a textured rubberized grip that virtually eliminates slippage, even in wet environments and other harsh conditions. A "USMC" inset is positioned in the handle's center, reminding all who see it that the Blackout Combat Sword is engineered to be Marine tough. Set atop the pommel is a convenient steel glass breaker - another contemporary addition that's perfect for escaping (or assisting others in escaping) entrapment in a wrecked vehicle or burning building, where glass windows may be the only means of exit. 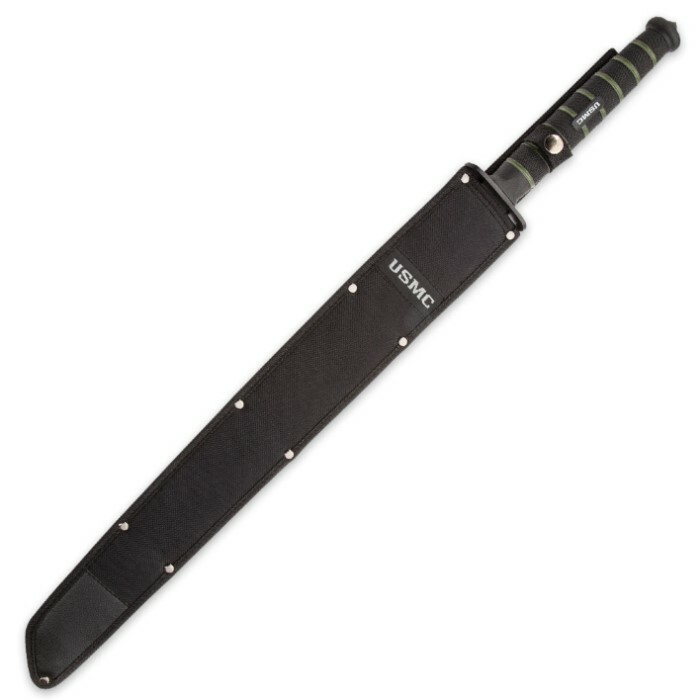 Add the included heavy duty black nylon sheath, and you've got an extraordinary tanto sword setup that honors traditional wisdom, while taking full advantage of the latest and greatest innovations. And since it's officially licensed by the United States Marine Corps, you can rest assured the USMC Blackout Combat Sword is in it for the long haul! I ordered this and got it in less time than they said it would take. I am very happy with it. The sword came very sharp and is very well made. The sheath is not extremely well made but that is not what I bought it for. Overall it is a very good sword for a collector and for outside use. Blade is sharp, has a nice handle, only flaw I could find was the blade is curved to the right (I'm sure this won't apply to every blade, so yours may not even have this issue). Suppose that can be corrected, but still well worth the $30 it cost.